"so hot it was unbearable"
We were on Air Macau flight from Osaka to Macau in the winter. The weather in both Osaka and Macau were very cold at the time, yet the cabin temperature was almost 30 degree Celsius. It was so hot that it was unbearable. Several passengers reflect the issue to the flight attendants yet nothing was done. It was like sitting in the baking oven. It was the worst 4 hour flight I have experienced. There were apparent difference in temperature between front section and rear section of the cabin (much hotter in the front and mid section). Maybe that's why the flight attendant who were staying in the back did not take passengers' request seriously. Cabin temperature is so important for passenger comfort and so simple to correct, it should also match the weather condition of the departure location. An hour late leaving Taipei. Plane seating was very tight but ok for me. Staff immaculate and very polite - probably this airlines saving grace. Food was hot but a bit bland. Couldn't hear hostess or pilot on the intercom. Return flight was ok smaller airbus but seating adequate. Again food was nice and hot but I had to ask for tea which should be served after meal. I didn't expect too much from an hour and a half flight but they could supply headphones and music. Also both flights were serviced by steps NO air-bridge - surely this wouldn't affect pricing too much would it? Overall fair for the price but some attention to detail needed. ICN-MFM on old A321. Seats are old styled and very tight. Service is outstanding but meals are poor. No various beverages for their serving as well. Captain spoke English very well. A321-200 is too narrow between seats and aisle however quite ok for me. For my next trip if the price is right then I may use this flight again. 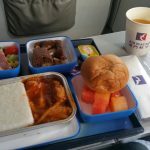 My wife and I recently flew MFM-CTU in business class. The flight departed Macau 40 mins late with no explanation offered to passengers. Once onboard A320 the polite though business like crew assisted passengers in storing carry on items. The aircraft interior could have used a thorough cleaning. 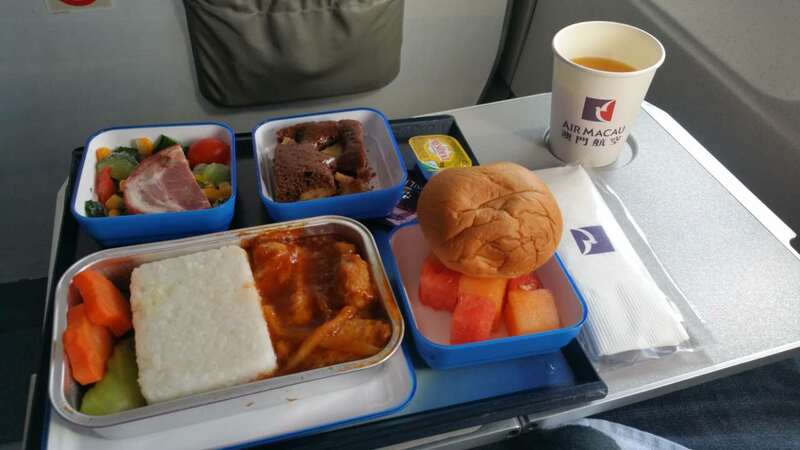 Meal service was efficient although flight attendants disappeared once the bland food was served. The pilot and first officer spoke excellent English cabin attendants could have used some tutoring. We chose this carrier because it offered the only choice of non stop service between Macau and Chengdu. Flew Air Macau from Tapei to Macau and back during the Chinese New Year. A321 were deployed at the TPE-MFM sector. Economy class was full seats were cramped but bearable for the 1.5 hr flight. Food was poor. MFM-TPE sector had no boarding bridge so has to take the bus to the aircraft. Which I find it quite annoying given how small the Macau International Airport was and not much traffic go through Air Macau still can't find a boarding bridge. Again food was poor on the way back. Crew on both flight were efficient though but lack of smile and can clearly felt that they were treating Business Class passengers better when the curtain between the two classes is still open. Taipei to Shanghai via Macao in Economy. Check-in swift and all flights on time. I was allowed to go ahead of the mess of tour groups at the Shanghai counter in order to check in. Seats are cramped and food is fair (you might want to eat before you board). Planes were full on all sectors. Bring a good book for entertainment. Not exactly the world's jazziest airline but certainly not the worst. Taipei To Beijing which transfered in Macau. Economy class seat was incredibly small. The food was OK from Beijing to Macau but is a nightmare from Macau to Taipei. Services well done and crew are polite. Passengers should notice that the airline often delay or cancel their flights. Y class MFM-BKK. Check-in with few smiles actually but smooth not charged any excess baggage charge despite being slightly overweight departure on time. Onboard the staff were polite and cheerful helped lifting heavy hand baggage in overhead locker and present throughout the whole flight. Language skills good and attentive in all our needs. Offered music headset pillow and blanket and at time of meal served also main course choice: appreciated that. Good security instructions by video presentation and good IFE with an interesting travelog film. Wide duty free choice. Toilet conditions could have been much better! For all the rest Air Macau is a reliable airline as far as I experienced especially in terms of helpful and knowledgeable onboard staff. I would recommend it also for its good fares and I would definitely prefer to fly again with them instead of trying low-cost competitors on same route. Shanghai to Taipei The flight was delayed for more than 3 hours without explanation. Eventually we were informed to board an A300. It was an awful and old aircraft and full of terrible smell and the air conditioning was not functioning properly. This airline does not pay attention to flight safety - I consider Air Macau is the worst airline I have ever taken. Macau-Shanghai. Business Class. Full cabin. Drinks meal tea and coffee all served and cleared away 45 minutes after take-off. Why the rush? I filled in a Customer Comment card requesting a reply but never received it. I definitely recommend avoiding Air Macau - it is worth going to HKG just to use DragonAir - 1000 times better than Air Macau.